I had this idea that wouldn’t it be great to give out free printed business cards to my favorite people? A wee social gesture from me in the form of a social object, which as I’m fond of saying, I believe is the future of marketing. 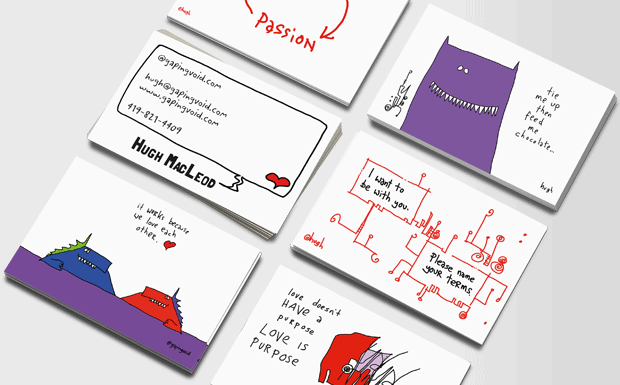 Once a day (weekdays, anyway) I’ll blog a new bizcard to give someone. First on my list? Brian Clark, whose SUPERB blog, copyblogger -i.e. all about marketing via online- is VERY high on my must-read list. Besides that, he’s fun to hang out at SXSW and drink cocktails with. This “Delusional” cartoon dates back from late 2009. I didn’t design it specifically for Brian (you can actually buy the print if you want), but I know from the horse’s mouth that he’s very fond of the image, so what the hell… I’m planning to do more customized ones in the future etc. Hugh, you smart cookie you… how funky and what a fun way to see how you relate to your community… 10/10. Very cool, Hugh. Copyblogger is a great site and Brian must be a great person to know! As an editor friend once taught me, it’s not “stealing”, it’s “repurposing”. 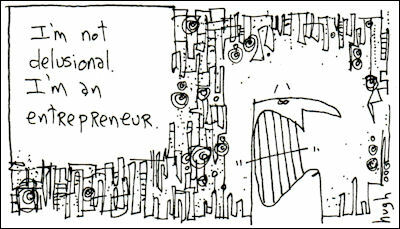 I wish there was a version that replaced “entrepreneur” with “filmmaker”. Shripriya, one thing you learn in my game, is to completely ignore “If only you’d do this, I’d buy it” blog comments. Mist of the time that turns out to be untrue. Talk is cheap etc. Also, the trouble with making every thing more customizable, is that you make it less personal, which has its own negative effects to deal with. 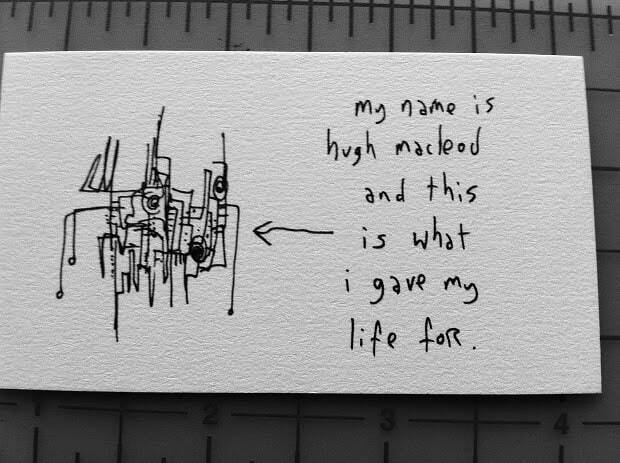 Hugh – I’ve actually bought two of your larger limited prints including the first one you ever offered to your newsletter readers. So… at least for me, I mean it. I agree, that everything can’t be customizable… but I think something like this which resonates with many people is appropriate. You pick 5 other creative things (say – filmmaker, musician, etc.) and you let people choose to replace that with entrepreneur. So, I guess my new goal is to become one of your favorite people, as that would be a cool thing to have…. But I like having the long-term focus this project will require. Amazing idea. Smart, creative, and fun! Plus – you seem to have a quality list of “favorite people” so I can’t wait to see who else is gets a card. Way to find a niche. Everybody has a list of “favorite people”, offline and on. Hugh- I read your comments to Shripriya, and I understand about not being interested in customizing/taking requests from random posters, but is there any chance you could add this card as-is to the Streetcards options? I know it isn’t likely you’ll say yes, but I figured: nothing ventured, nothing gained.